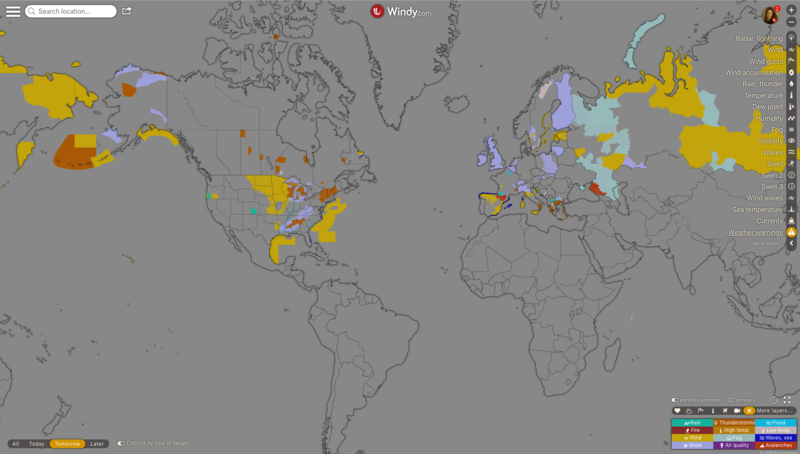 CAP Alerts alias "Weather Warnings" Finally on Windy! 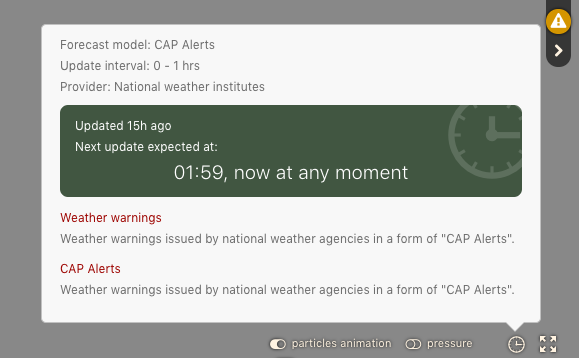 Many people were waiting for this feature for a very long time, and here it is: The so called CAP Alerts displayed on Windy as a new layer "Weather warnings". The Common Alerting Protocol (CAP) is a standard message format designed for media, civic authorities and large public. 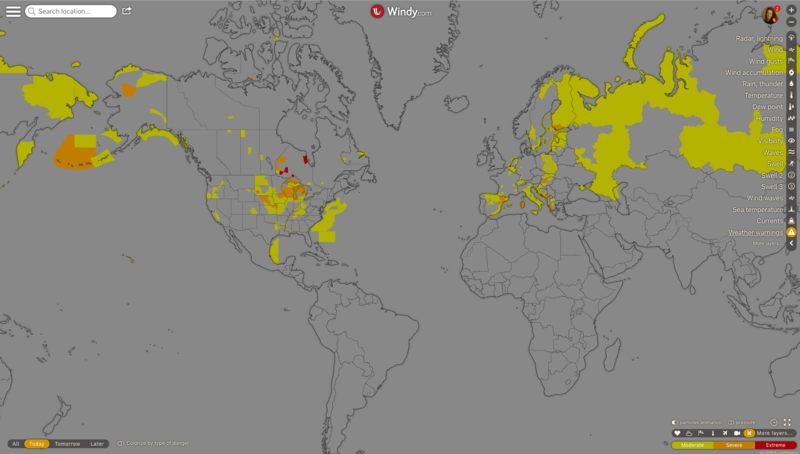 It generates warnings on all possible dangers: weather, fires, earthquakes, volcanoes, landslides, etc. etc. Official alerting authorities include: national meteorological or hydrological services, emergency management agencies, or any other organisation authorised to perform the function of alerting. Benefits of CAP: If alerts are timely and appropriate, people can reduce damage and loss of life. Note: All types of warnings should be understood as risks, not as observations. For example, "Fire" should be considered as "conditions that could lead to potential fires", mainly due to drought and lightning near forests. These are not fires that have already started, although they could as well. Rain, Thunderstorms, Flood, Fire, High temperature, Low temperature, Wind, Fog, Waves & sea, Snow, Air quality, Avalanches. You can select the time range to show the related data on the map, the options being: All, Today, Tomorrow, and Later (with the "All" option including all three of the following options together). 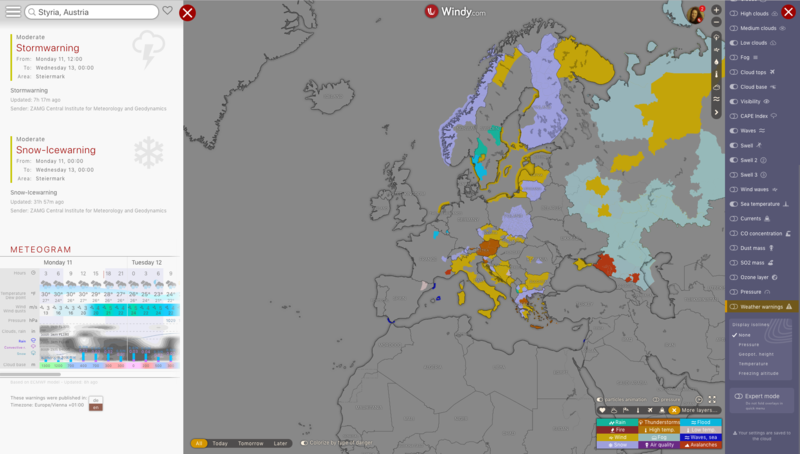 Once you pick a location on the map, a detail will open with info about the weather warning(s): intensity and type of the warning, duration, region, source + update time, some instructions, language of the warning publication, meteogram + timezone for the location. 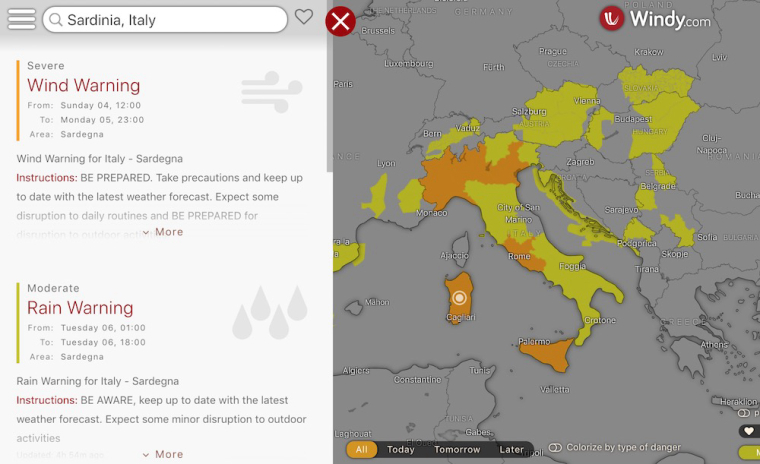 Data providers: In case of Europe, we source the alerts from Meteoalarm.eu. Please note, the data by Meteoalarm.eu are not provided on a district level, so at this moment it is not possible to have the data for a separated district. We are not sure at the moment if future developments are being done in this area. If so, we would consider this improvement. All your suggestions will be considered in this thread, or you can use the discussion here. We can not repeat it enough: Stay safe!